The estates Lord Crewe left to his charity in his will of 1721 had been acquired through purchase of property formerly belonging to the family of his wife, Dorothy Forster. Sir William Forster and his sons had been considerable landowners in Northumberland, with the lordship of the manor and castle of Bamburgh. Also among their possessions were the small towns of Shoreston and North Sunderland, the manor of Blanchland and its monastery, the rectory and monastery of Shotley, Fleetham in Bamburgh parish, the manor of Thornton, houses at Alnwick, fishing rights on the Tweed and on the Derwent, and the presentations to four livings and chapelries. After the death of Sir William and his sons. the property passed to Dorothy Forster (Lady Crewe) and her nephew Thomas Foster. However the family had run up substantial debts and their creditors petitioned Chancery for the sale of the estates to meet their accumulated debts. 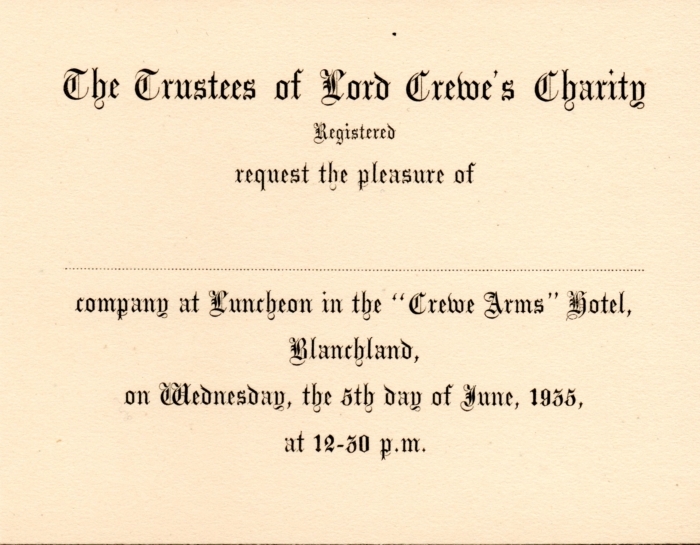 Lord Crewe gradually bought up all the family property from the Crown for a total sum of £20,697 10s, and it was conveyed to Lord Crewe by deed on May 15th and May 16th 1709. Thomas Forster was chosen to be the General of the 1715 Jacobite Rising and this has led to suggestions that he forfeited his estates at this time. However in 1715 these estates had already been in the possesion of Lord Crewe for some years. The village of Blanchland is centred on the original monastic buildings of the Abbey, and was developed by Lord Crewe's Trustees into a model village. The village remains in the ownership of the Lord Crewe's Charity, including a mixture of residential accommodation and businesses, and agricultural and other uses. In Bamburgh, North Sunderland and Seahouses the Charity owns the sites of a number of local businesses (such as the golf club and caravan park), some local amenities, and a number of farms. The Trustees owned Bamburgh Castle for more than 170 years, but faced with massive costs for restoration sold it to Lord Armstrong in 1894 for £60,000. Thy also built and opened the new harbour in North Sunderland in 1889. Other significant sales from the original estates have included the western edge of the Blanchland Estate in the early twentieth century, and parts of Seahouses Village, including the harbour, and twentieth century developments.